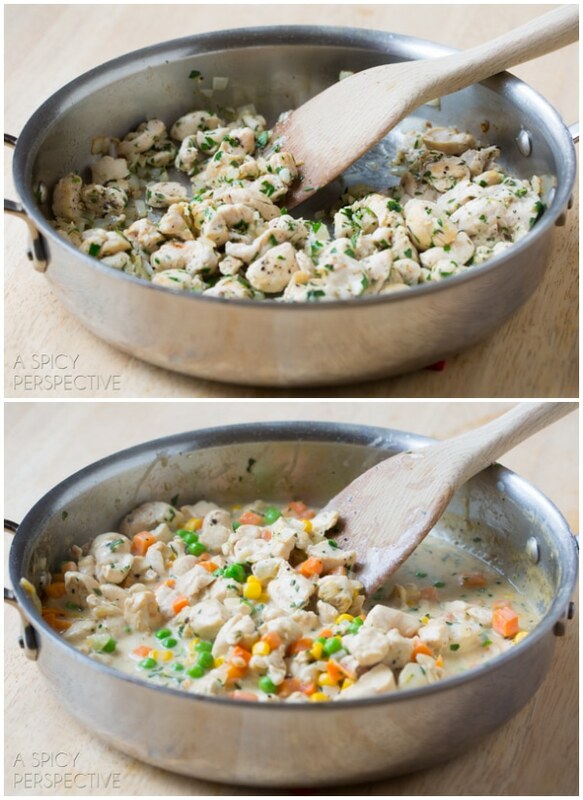 This is (in my opinion) the best chicken pot pie recipe ever. So what makes this pot pie recipe so special? Love, butter and a homemade pastry dough recipe! One of the joys of cooking is being able to share a meal with someone in need. Whether we’re delivering dinner to a sick friend or new parents, or simply inviting guests into our home, there’s something therapeutic for both the cook and the recipient when made-from-scratch food exchanges hands. I get emotional benefits (and even spiritual benefits) from offering an act of love to another human being, and they receive the warm soothing message loud and clear. That is what cooking can do. We often underestimate the power of a home-cooked meal. Yet feeding people well can bring a certain healing and internal peace that resonates deep within. Chicken pot pie is one of those dishes that is especially comforting and always well received. I’ve made many pot pie recipe variations over the years, with pie crust and store-bought puff pastry. But I have found that what really makes a pot pie recipe stand out, is a killer, made-from-scratch pastry dough. My very best chicken pot pie recipe starts with a pastry dough recipe that is somewhere between a puff pastry and a blitz pastry. 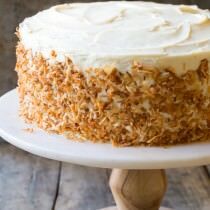 It’s light and airy, with crisp, buttery layers that bake to golden perfection. The flaky texture of the baked pastry complements the rich goodness of white-meat chicken, veggies and a silken-cream chicken base. I also like to add a dash (or two) of cayenne to provide an unexpected kick of flavor. This is the sort of meal I would offer a friend or family member who needs a pick-me-up. My best chicken pot pie recipe can work its magic like nothing else! Along with feeding those in your immediate circle, another wonderful way to share the joys of a good meal with people in need is to partner with Land O’Lakes, Inc. in Pin a Meal, Give a Meal. Currently, one in six people is living at risk of hunger in America. But there is hope and there are ways to help. 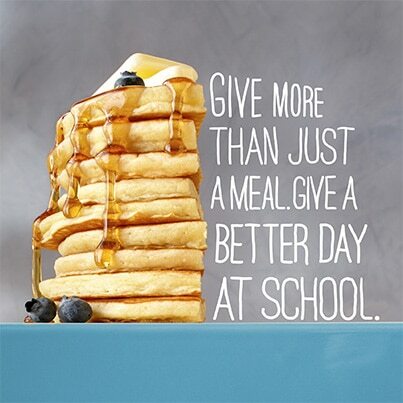 Land O’Lakes has partnered with Feeding America® to kick off their second year of the Pin a Meal, Give a Meal campaign. 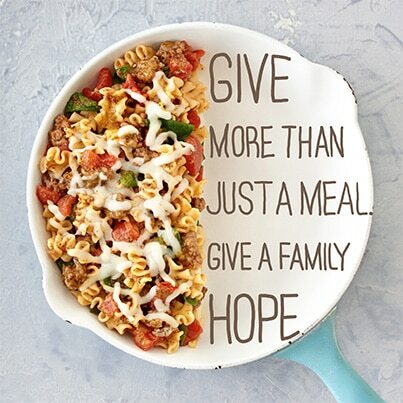 For every Land O’Lakes recipe that is pinned or re-pinned between March 28 and May 31, 2014, the Land O’Lakes Foundation will donate 9 meals to Feeding America® – with the goal of 2.7 million meals. You’ll get easy meal ideas and help us fight hunger at the same time! 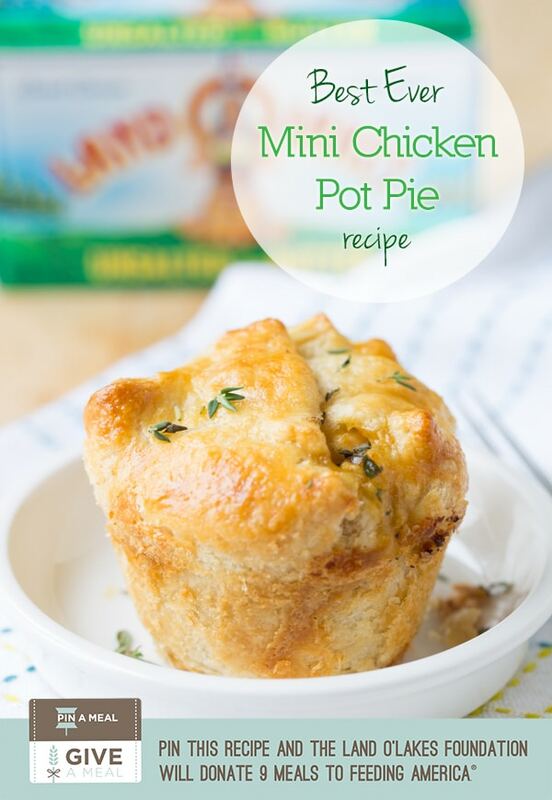 You can pin my signature recipe, Mini Chicken Pot Pies, to contribute 9 meals to Feeding America. And you can also pin more recipes from Land O’Lakes to contribute even more meals. When you help feed a family, you’re helping people live full, active lives and make a better future! You will need a Pinterest account to pin or re-pin Land O’Lakes recipes. Creating a Pinterest account is free and easy. Visit https://pinterest.com/join/signup to learn how. Then visit Land O’Lakes and start pinning! Make sure to include the #GiveaMeal hashtag. 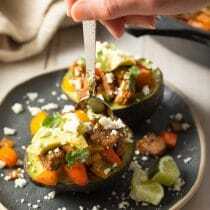 See the Pin a Meal, Give a Meal Pinterest Board. Go to Land O’Lakes Pinterest Page. 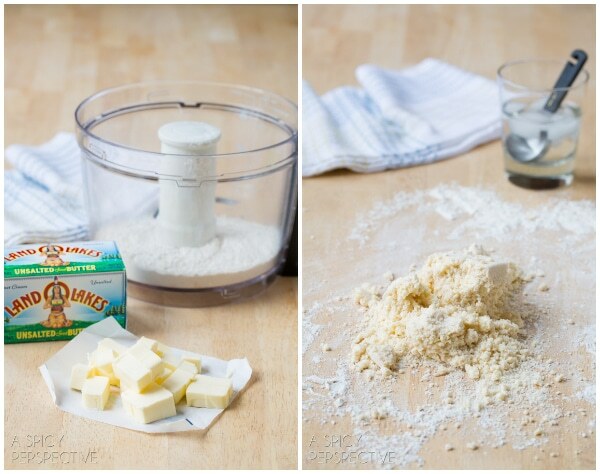 For the pastry dough, place the flour, sugar and salt in the food processor and pulse a few times. Pour water over a cup of ice to chill. Then cut the cold butter into cubes and add to the flour. Pulse several times until the butter is cut into the size of peas. Add 3 tablespoons ice water (without the ice) and pulse again until the dough absorbs the flour and looks like soft pebbles. Flour a work surface and dump the crumbly dough out onto the surface. Press together into a flat square, then fold toward the center into a 3-section fold. 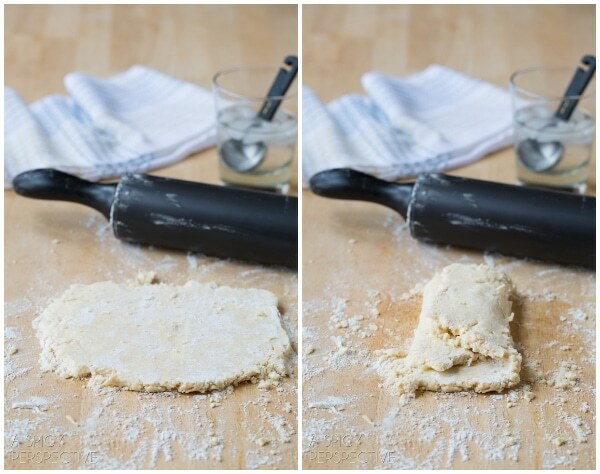 Roll the dough down to 3/4 inch and fold again in the same manner. 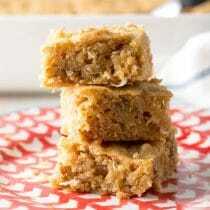 If the dough is not coming together, sprinkle 1 teaspoon of ice water over the top and keep folding. Fold and roll the dough 3-4 times, until it is smooth. Then fold into a rectangle, wrap in plastic and chill. 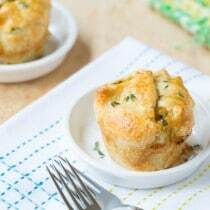 Preheat the oven to 400o F and spray a muffin tin (or 4 – 6 ounce ramekins) with non-stick cooking spray. Place a large skillet over medium heat and add the butter and onions. Sauté 2 minutes, then add the chicken pieces and garlic. Sauté another 2-3 minutes, then add the flour, herbs, and chicken base. Stir to coat. Pour in the water and cream, then stir well. Allow the mixture to come to a simmer to thicken, then add the frozen veggies. Taste for salt and pepper and add a couple of dashes of cayenne for a little kick. Remove from heat. 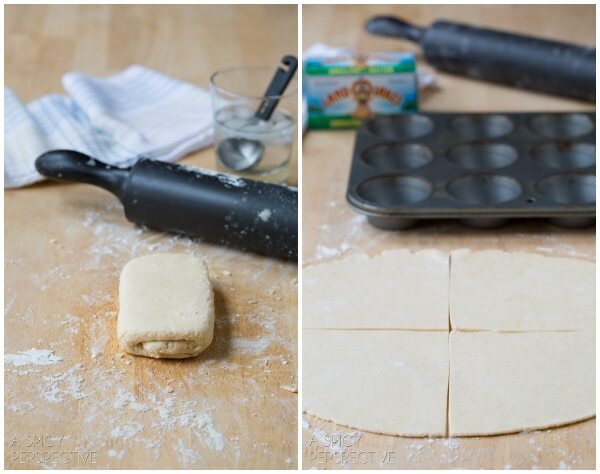 Now take the pastry dough out of the fridge and roll out into a 12-inch circle/square. Cut it into 4 equal triangular pieces. Then fit each piece down into the prepared muffin tin. Spread them apart—they grow! Fill the pastry dough with chicken filling, spooning in the creamy base. Then loosely fold the flaps over the top. It’s okay if there are gaps in the top as long as the pastry dough sides come up high. Brush the egg wash over the top of the pastry dough. Bake for 20-25 minutes on the bottom rack, until golden brown. Allow them to cool for 10 minutes. 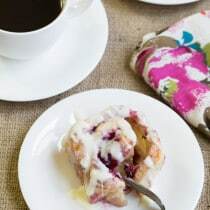 To serve, run a butter knife around the inside edge of the muffin tins. Tip the knife down and carefully lift each pot pie out. If you accidentally poke a hole in the pot pie, serve it in a bowl. A Spicy Perspective has partnered with Land O’Lakes for an exclusive endorsement of Land O Lakes® Butter for the Kitchen Conversations blogger program. This blog post is sponsored by Land O’Lakes. This looks wonderful. Can these be made ahead and frozen? 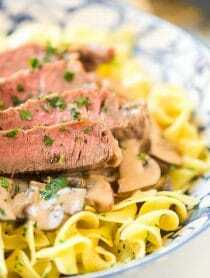 I truly like this recipe and the specific spin that you’ve put on it. on how I get on. Cheers for the great idea! Can I freeze these before baking them? If so, I’m wondering what temperature to bake them at and for how long if they’re frozen? Any advice is much appreciated! I’m really looking forward to trying out this recipe! Yes! You may have to double the bake time and cover with foil half way through baking, but they turn out great! Thanks, Sommer! I tried the recipe and I love it! The crust is so delicious and the filling is very flavorful. I actually used 2 small pie pans. I baked one and froze the other. I’m planning on baking the frozen pie later on this week. I’ll let you know how it goes! Thanks for the recipe! 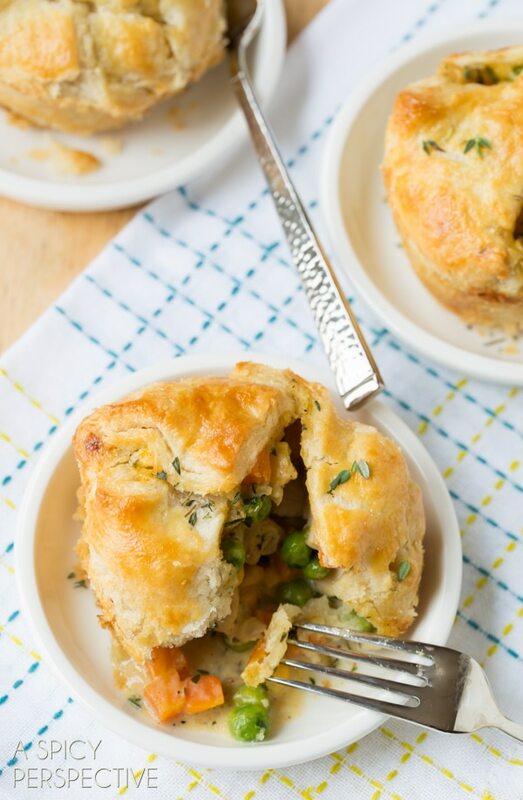 These pot pies look crazy amazing! These little pies look really lovely. Can you tell me, please, how much a stick of butter weighs as our butter doesn’t come in “sticks” in the UK but in 8oz blocks? Hi Christine! Each “stick” is 4 oz butter. Holy guacamole they are almost too adorable to eat! I can’t wait to try these! I love this! There are so many benefits to sharing food (both on the giving and the receiving end!) I’m definitely pinning this. Can’t wait to try the pastry recipe! blog, but these little guys should freeze well too. Homemade chicken pot pie is one of the best comfort foods ever, perfect for showing some love to those in need. Love these, Sommer! Love the small size of these! My kids will love this! Pinning to make this weekend! 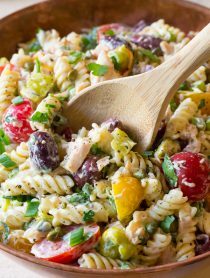 Holy goodness – i have to make this for my family! They will love it!! These are adorable and all for a great cause! 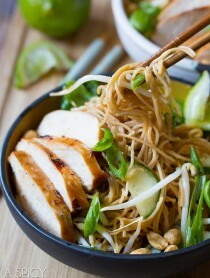 Just saw these on G+ OH MY I have got to make them! Printing them out now. I wish I had seen the recipe last month so I could have pinned them for the cause. I love supporting Feeding America. These look savory and good. I hope to serve them up some night soon! Have a blessed Monday Sommer! These are just adorable. Really, so cute. I love that Land O’ Lakes is helping feed America. Sharing!!! Oooh those look amazing! 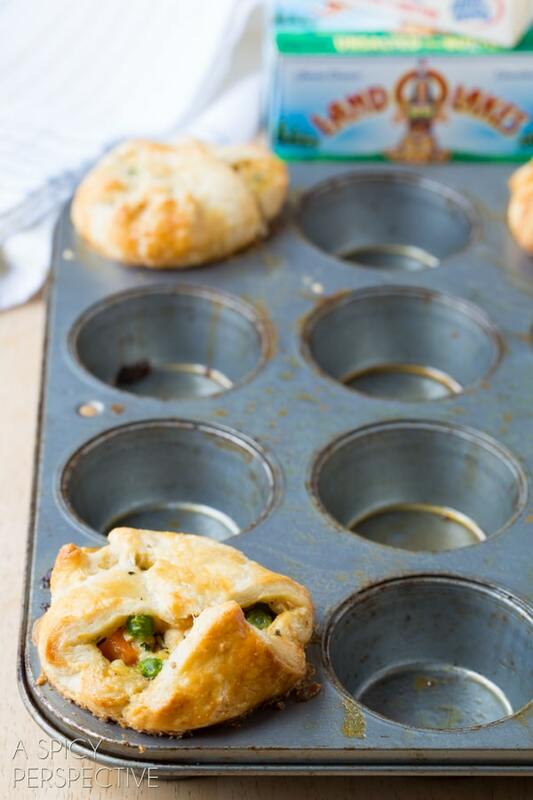 We love pot pies at our house but I’ve never done mini…they look perfect for lunches. And I’m pinning! So fun and cute!! Off to pin, pin, pin! These are too adorable, Sommer!! I love them! 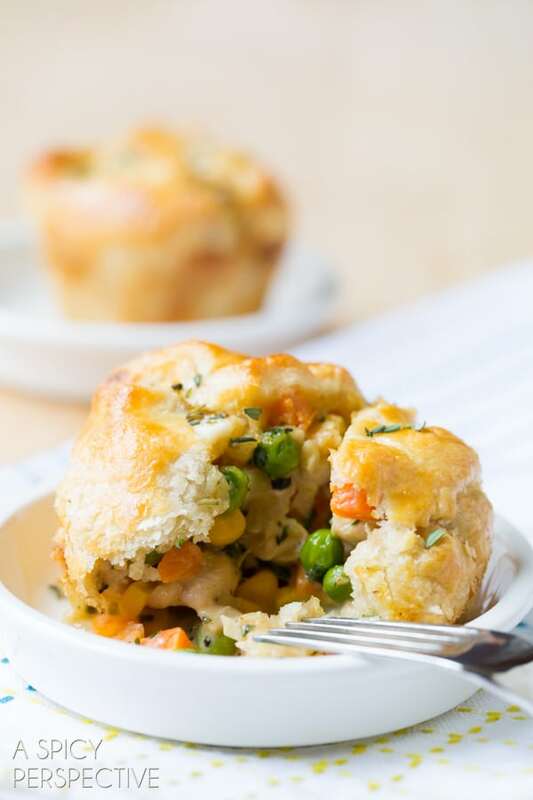 I love my chicken pot pie full of vegetables and your version looks perfect! This is a great campaign and the recipes looks fabulous. Off to pinning we go. Such a great post for many reasons!!! And these little pot pies are just calling to me!!! This is a great campaign! 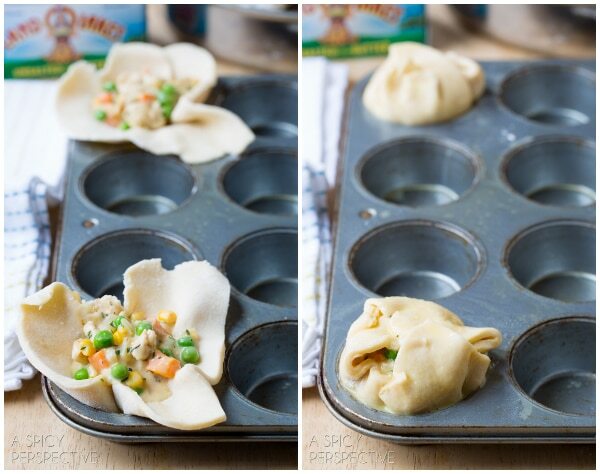 And these mini chicken pot pies look absolutely amazing. The homemade pastry dough seems unbelievably rich and flaky — decadent and comforting at the same time.